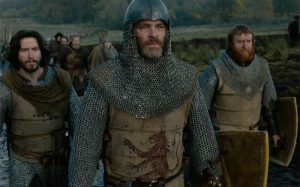 The film presents the real story of a king who turns from a noble defeated to a hero outlawed during the oppressive occupation of medieval Scotland by Edward I of England. Despite the serious consequences, Robert is determined to regain his crown and territory, so he gathers a group of loyal and eager men to fight against the great army led by tyrant Edward and his volatile boy Prince of Wales. Robert is leading his restraining group of warriors in a siege of violence and passion, risking his life to recover what is rightfully right.